This article is about the railroad shop structure. For other uses, see Roundhouse (disambiguation). The John Street Roundhouse, now part of Roundhouse Park in Toronto, Canada, viewed from the CN Tower in September 2012. A railway roundhouse is a building with a circular or semicircular shape used by railways for servicing and storing locomotives, and traditionally surrounds, or is adjacent to, a turntable. Operational roundhouse in Wolsztyn, Poland. Changhua roundhouse at Changhua, Taiwan, built in 1922 and still in use today. North Midland Railway roundhouse at Derby, England, built in 1839, as it was in 2006. 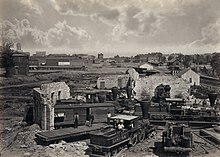 Roundhouse in Atlanta, Georgia, 1866. Interior layout exposed by extensive American Civil War damage. Early steam locomotives normally travelled forwards only. Although reverse operations capabilities were soon built into locomotive mechanisms, the controls were normally optimized for forward travel, and the locomotives often could not operate as well in reverse. Some passenger cars, such as observation cars, were also designed as late as the 1960s for operations in a particular direction. Turntables allowed locomotives or other rolling stock to be turned around for the return journey, and roundhouses, designed to radiate around the turntables, were built to service and store these locomotives. Most modern diesel and electric locomotives can run equally well in either direction, and many are push-pull trains with control cabs at each end. In addition, railroads often use multiple locomotives to pull trains, and even with locomotives that have distinct front and rear ends, the engines at opposing ends of a locomotive "consist" (a group of locomotives coupled together and controlled as a single unit) can be aligned so they face opposite directions. With such a setup, trains needing to reverse direction can use a technique known as a "run around," in which the engines are uncoupled from the train, pull around it on an adjacent track or siding, and reattach at the other end. The engineer changes operating ends from the original locomotive to the one on the opposite end of the locomotive consist. Railroad terminals also use features such as balloon loops and wyes (Commonwealth: triangle) to reverse the orientation of railroad equipment. Because of the advent of these practices, modern roundhouses are frequently not round and are simply large buildings used for servicing locomotives. Like much other railroad terminology, however, the structure has retained its traditional name. The alternative term engine-house encompasses both semi-circular and rectangular structures and broadly describes all buildings intended for storage and servicing of locomotives. Shops or workshops are buildings containing hoists and heavy machinery capable of major repairs beyond routine servicing. Some roundhouses include shop facilities internally or in adjoining buildings. Since the great dieselisation era of the 1940s and 1950s, many roundhouses have been demolished or put to other uses, but a few still stand and remain in use on the railroads. Early roundhouses were too small for later locomotives. The unusual shape of the buildings can make them difficult to adapt to new uses, but can also be aesthetically appealing. Valley Heights roundhouse, 75 kilometres (47 mi) west of Sydney, New South Wales, is the oldest surviving roundhouse in Australia, and has been preserved as a railway museum. The London Roundhouse Project London, Ontario, Canada, is an extensive renovation of the Michigan Central Railroad steam locomotive repair shop which was built in 1887. It is to become the new home of Ellipsis Digital and Engine SevenFour, a pair of emerging technology companies. The Canadian National Railways roundhouse at the Turcot Yard in Montreal, built in 1906, was the largest ever built in Canada. Its demolition in 1962 to make way for the Turcot Interchange illustrated a profound change in transportation habits across North America. The Steam Whistle Brewing brewery in Toronto, Ontario is located in the building known as the John Street Roundhouse, a former Canadian Pacific Railway steam locomotive repair facility. The museum roundhouse in Wolsztyn, in western Poland, continues to supply steam locomotives for regular national rail services (as of 2011). Probably the first railway roundhouse was built in 1839 at Derby, England by the North Midland Railway. The Derby roundhouse was restored in 2010, being converted into a brand new site for Derby College, with a new addition called the 'Stephenson Building' including the other survival of demolition - the original Midland Counties Railway workshop. The new site was opened in September 2009. Tours can be arranged through Derby Tourist Information Centre. The Fenton, Murray and Jackson building in Leeds (1831–1843), a private workshop, may previously have been laid out in a radial pattern like a roundhouse. In a guidebook of the time we are told "The engine-house is a polygon of sixteen sides, and 190 feet (58 m) in diameter, lighted from a dome-shaped roof, of the height of 50 feet (15 m). It contains 16 lines of rails, radiating from a single turn-table in the centre: the engines, on their arrival, are taken in there, placed upon the turn-table, and wheeled into any stall that may be vacant. Each of the 16 stalls will hold two, or perhaps more, engines." This roundhouse narrowly escaped demolition when the works closed down, and was classified as a listed building. The Roundhouse, Chalk Farm, London was built in 1847, but was too small for its function within 20 years (it is now an arts centre and concert venue). Barrow Hill Engine Shed, which is home to a number of preserved locomotives is still in use. The B&O Railroad Museum complex in Baltimore, Maryland contains the restored railcar maintenance roundhouse of the Baltimore and Ohio Railroad. It is said to be the world's largest 22-sided building. The roundhouse located on the BNSF line, with the last stop in Aurora, Illinois, was purchased and restored by NFL football player Walter Payton. After Payton's death the roundhouse was renamed Two Brothers Roundhouse, with a plaque mounted in Payton's honor. The vast majority of roundhouses built in the US and Canada no longer exist, lie in ruins, or have been repurposed; however, a small number of them still exist and continue to operate in their intended capacity as locomotive storing and servicing facilities. Below is a list of locations with operational roundhouses that are also open to the public. ^ PRNewswire press release, September 15, 2004. ^ "Annual Report 2000" (PDF). The Henry Ford. Retrieved August 4, 2016. ^ "Riding the Rails – Connecticut Eastern Railroad Museum – Train Aficionado". www.trainaficionado.com. Retrieved 2018-10-19. ^ "Union Pacific Roundhouse Turntable and Machine Shop". Wikimedia Commons has media related to Roundhouses.